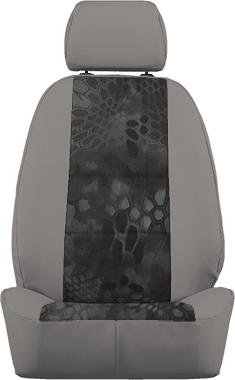 ShearComfort’s Military Seat Covers are durable, precision-cut, and come in a variety of high-quality patterns including Digital Urban Camo, Digital Desert Camo and Classic Camo. Or you can put your patriotism on full display with our American Flag Seat Covers. Our Military Seat Covers come in four unique styles including Forest, Desert, and Urban Digital Camo seat covers. For a more time-honored look, our Classic Military Camo Seat Covers are a great option. 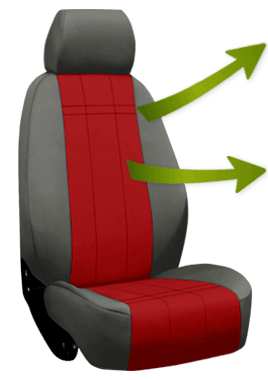 These military-style seat covers look great, but they’re also made of highly durable canvas-like fabric that prevents wear and tear on your original upholstery. Plus, with the use of precision-cut technology and our perfect fit guarantee, these products are sure to enhance the look and quality of your interior. Would you rather have a set of patriotic seat covers? 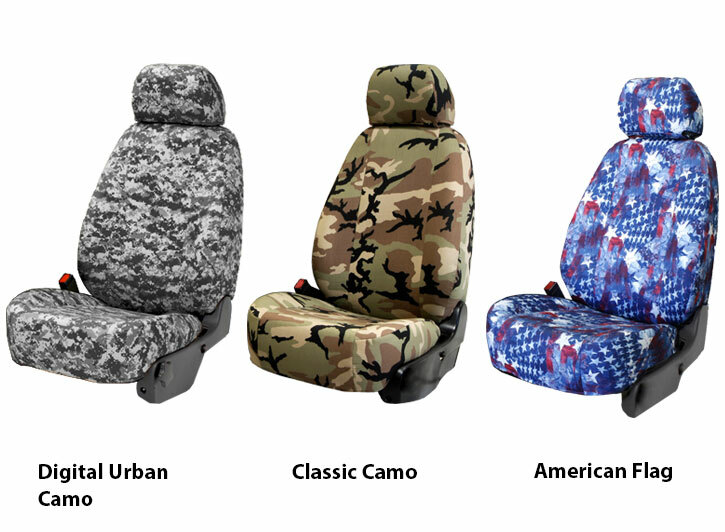 Choose our American Flag Seat Covers for a unique camo-like take on the distinct appearance of the American Flag. This product is a highly durable Neoprene Style Fabric and is precision-cut for a perfect fit. Get patriotic with our American Flag Seat Covers. Product Review: These seat covers were a Christmas present for my husband - he loved them (I had been looking for 3 years to find a company that ships to a Canadian address). They were easy to install and they fit great. I believe they will last a long time. General Experience: I have been trying to quality seat covers in this print for three years - most companies wont deliver to Canada. This product was paid in Canadian funds (no exchange, no duty) and was shipped in Canada. I was surprised at how fast my order came. I was glad that I had it delivered to my work and not home as the return address clearly says Seat Covers by ShearComfort so that could have ruined a Christmas surprise. Product Review: I really like them. Installation was easy, good instructions. They look fantastic and seem tough. General Experience: I have purchased 3 sets from you for my F150. These last ones are by far the best. Product Review: Good seat covers. Stitched strapping not in ideal locations for the application in a couple locations, and cheap plastic strap clips that can break easily necessitating replacement with something stronger. I had three plastic clips that broke. Also, application-specific installation instructions could have been provided rather than a general instruction. Product Review: Exact fit and easily installed. General Experience: Website is very easy to navigate and they keep you informed of your order status.